Located near Manhattan’s Theater District, this 150-unit apartment building is typical of many apartment houses built in New York City during the 1960’s. Originally designed for small families and young singles of moderate income, the building is comprised of mostly one-bedroom and studio apartments. White glazed brick and aluminum windows are the primary exterior materials. During the 1980’s and early 1990’s the neighborhood became less desirable and the building suffered from neglect. Seeing an investment opportunity in the revitalized Times Square and Theatre districts, the new owner purchased the building in 2001 with the plan to upgrade and enhance the apartments and public spaces. The design for the lobby space renovations is simple, yet dramatic. 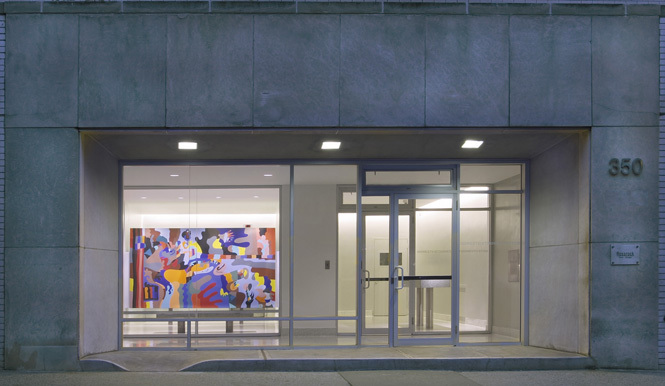 Renovations included the refurbishment of the existing terrazzo floor and the installations of a new ceiling, new lighting, new pre-cast terrazzo seating and reception desk and a new aluminum storefront entry. 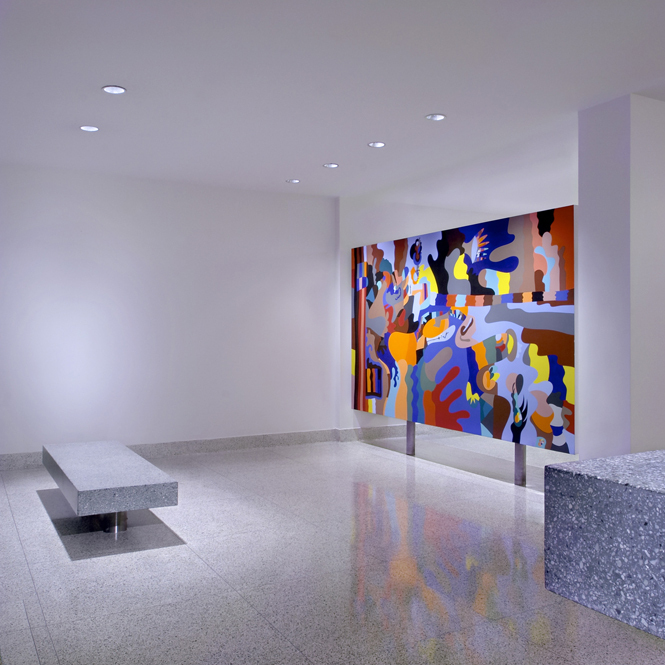 The most dramatic feature of the lobby renovation is an “in-situ” painting by New York artist Luke Gray. 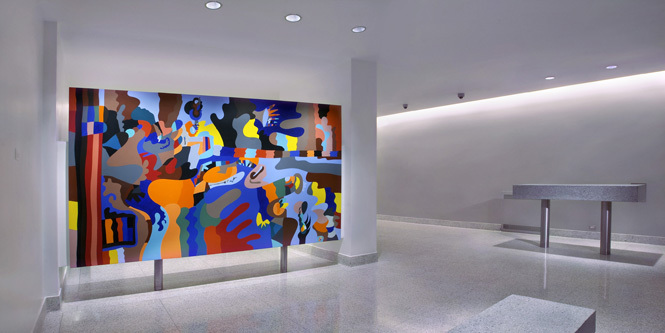 An existing screen wall, concealing the mailbox area from the main lobby space, was enlarged to over 6 feet high by 11 feet wide for Mr. Gray’s colorful abstract creation entitled “Traveler”. In the artist’s words, “the experience of travel is suggested, as the viewer’s eye wanders through an abstract and fluid landscape of diverse color, form, and scale. The intention is to mirror the variety in the building’s inhabitants and their individual stories, as well as to describe a contemporary place where boundaries of space, time, and personal history have melted down and coalesced.